Mike Sullivan's Toyota dealership in Santa Monica, Calif., is mobilizing to sell the hydrogen-powered Mirai fuel cell vehicle and ensure that early adopters have a good experience. LOS ANGELES -- For the first time in his 39-year career in the car business, Mike Sullivan has a car he isn't trying to sell. Sullivan's Toyota Santa Monica dealership is one of just eight stores in California chosen by Toyota to sell the Mirai, a sedan that's powered by hydrogen fuel and promises a 312-mile range. But with the rare opportunity to sell such an innovative car comes the added pressure of not bungling a crucial new product for Toyota. Volume isn't the challenge. Toyota hopes to sell only about 3,000 Mirais nationally by the end of 2017. After the initial eight stores in California get the sales process up and running, additional stores in the Northeast could start selling the car as early as 2016. But as the first hydrogen-fueled production car available for purchase, the Mirai does put an extra burden on dealers: The people who buy one need to love the experience and essentially serve as ambassadors for a zero-emissions technology that's not well understood. "These are trailblazers, early-adopter-type customers," Ed LaRocque, Toyota's national marketing manager for the Mirai, told Automotive News. "They're going to come in educated, and the customer experience for this product is very important to the dealers and Toyota. We have to get it right the first time." With a starting price of $58,325 before incentives, including shipping, and a limited number of hydrogen fueling stations, the Mirai isn't necessarily a good fit for everyone, something Sullivan is keenly aware of. "With everything else on my lot, I'm selling something. It's what I do," Sullivan said. "This car is the exact opposite. It's the reverse of selling. We're going to turn people down if this isn't the car for you." Online orders for the Mirai are set to start July 20, with deliveries at the eight chosen dealerships expected to begin in October. Sullivan -- whose Santa Monica store is part of his 10-store LAcarGuy network in Los Angeles -- hopes to get a demo Mirai in August. Toyota has already led two full-day immersive training programs for the eight Mirai dealerships, both on the sales and service side, and ongoing training is planned. The eight stores that will sell the first Mirais were chosen based on several factors: They're among Toyota's top volume sellers for hybrid and electric vehicles in the country, they're located near current or planned hydrogen refueling stations, they have the financial resources to handle any necessary upgrades to their sales and service departments, and they're in locations where a bulk of the Mirai's expected buyers live. With an eye on luring in those target buyers, Sullivan is planning several public and private parties where potential customers can see and drive the car in the months leading up to its on-sale date. Sullivan, never shy in front of a camera, took to the live video streaming app Periscope in early June to give dozens of viewers a walkaround and demonstration of the Mirai. More of these events, and a broader social media presence, are planned. Adapting an approach taken when the Scion brand launched more than a decade ago, Sullivan's Santa Monica store will have a dedicated Mirai "champion," a point person who will handle nearly all of the test drives and deliveries. Despite the importance of the Mirai experience at Toyota dealerships, minimal changes are necessary to the building in Santa Monica. The biggest upgrades are on the service side, where Sullivan is repurposing a repair bay that will be used solely for the Mirai. 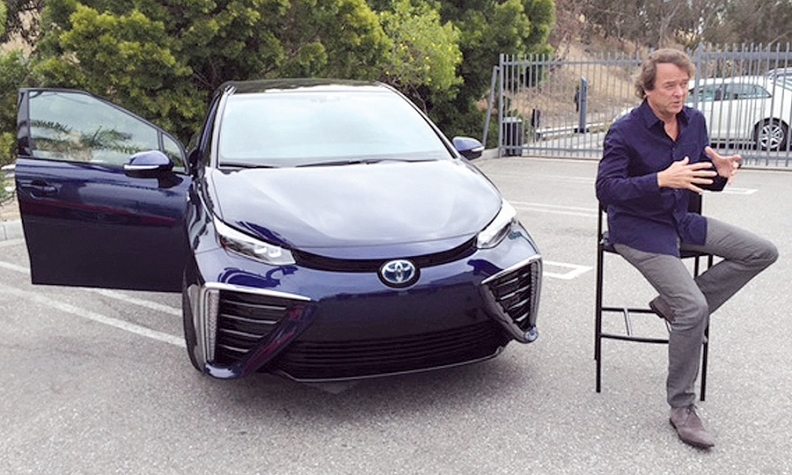 He's also planning on installing his own hydrogen filling station, where his Mirai customers can refuel, he said. All told, Sullivan estimates the upgrades will cost him around $150,000. That's a small price to pay for the chance to help launch a landmark vehicle for Toyota, Sullivan said. "This is a special car," he said, "and you have to want to be part of the change."